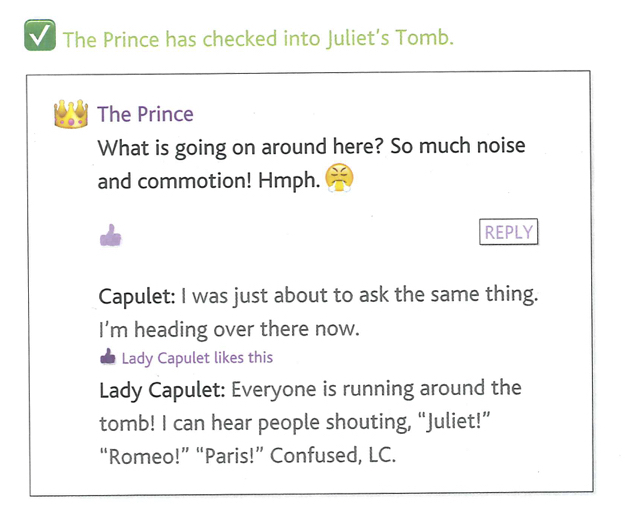 Shakespeare, William, and Courtney Carbone. srsly Hamlet. New York: Random House Books for Young Readers, 2015. Shakespeare, William, and Brett Wright. YOLO Juliet. 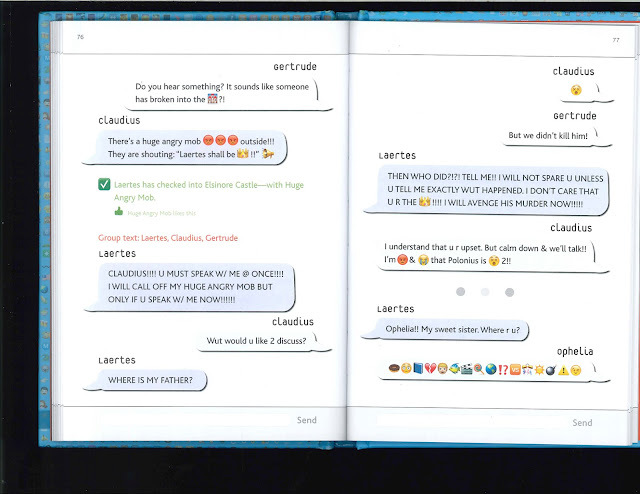 New York: Random House Books for Young Readers, 2015. 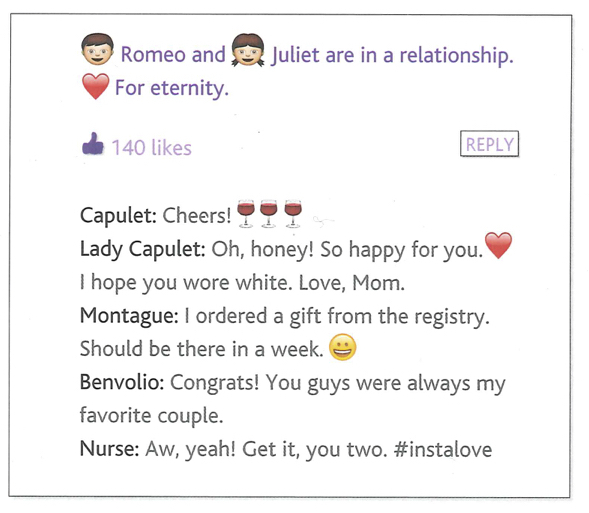 Shakespeare, William, and Courtney Carbone. Macbeth #killingit. New York: Random House Books for Young Readers, 2016. Shakespeare, William, and Brett Wright. A Midsummer Night #nofilter. New York: Random House Books for Young Readers, 2016. I stumbled across a new series from Random House when browsing through my local bookstore the other day. 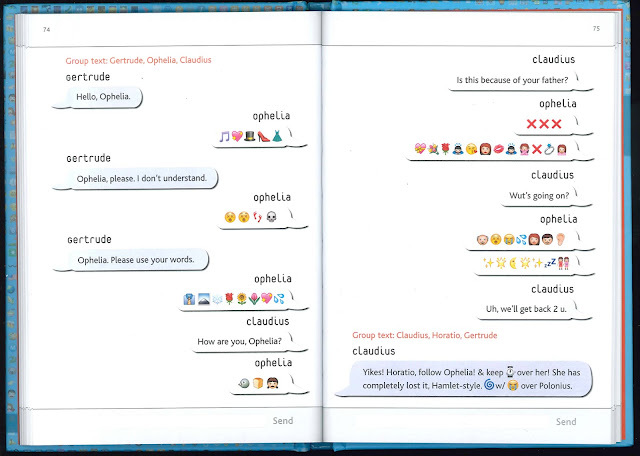 It's called "OMG Shakespeare," and it retells four (so far) of the plays as text exchanges between the characters. I'm a bit torn about these books. Clearly, I'm not in the center of the demographic for the books. There are also parts of them that are really bad—by which I suppose I mainly mean "uninteresting." But then there are also very clever ways of grappling with the problems that arise when presenting these stories in this medium. 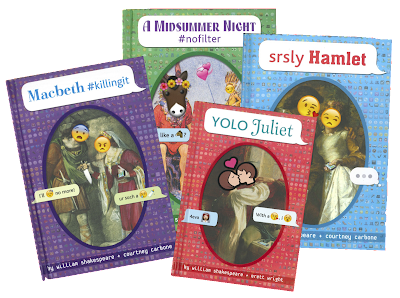 And the kids I've shown these to (kids that I've directed in multiple Shakespeare productions—so they know their Shakespeare, and they also know their Snapchats, their emojis, their Facebooks and Twitters, and their other social medias) really, really like them. They show each other certain pages or comments and they laugh hysterically. That can be very tedious and annoying. But then the book will play with the form in a genuinely interesting way, bringing other forms of social media into play. 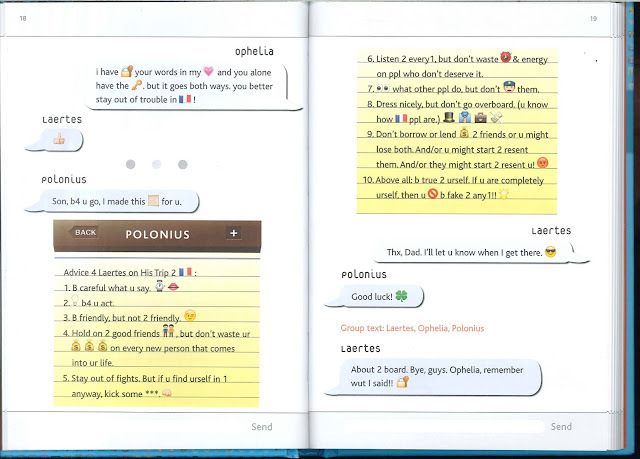 Here are two two-page spreads as an example. 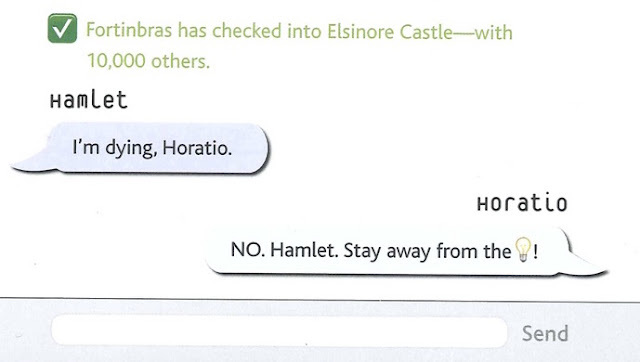 First, Polonius gives his advice to Laertes. Then Laertes accidentally tells Ophelia in a group text to remember what he said, giving Polonius the opportunity to put his nose in. 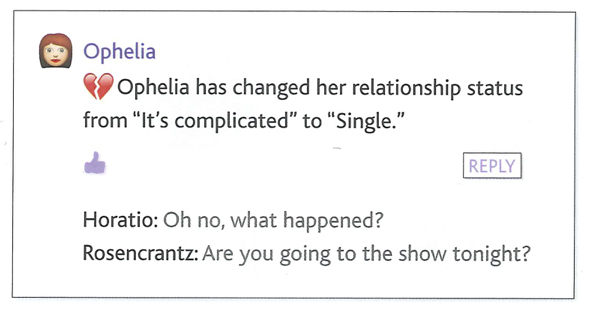 And don't fail to note the end of the sequence: Ophelia updates her relationship status Facebook-style. The two reactions also show some depth of thought. 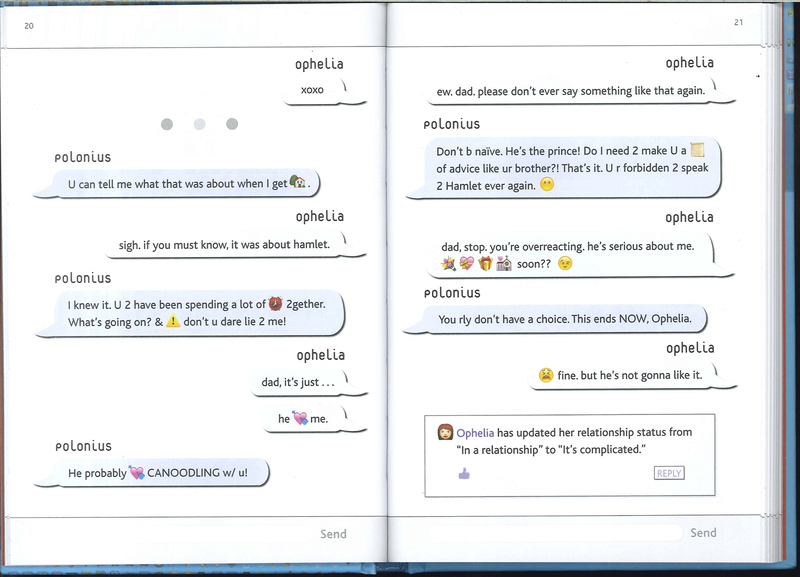 Horatio is concerned—probably mostly for Hamlet, but also for Ophelia. 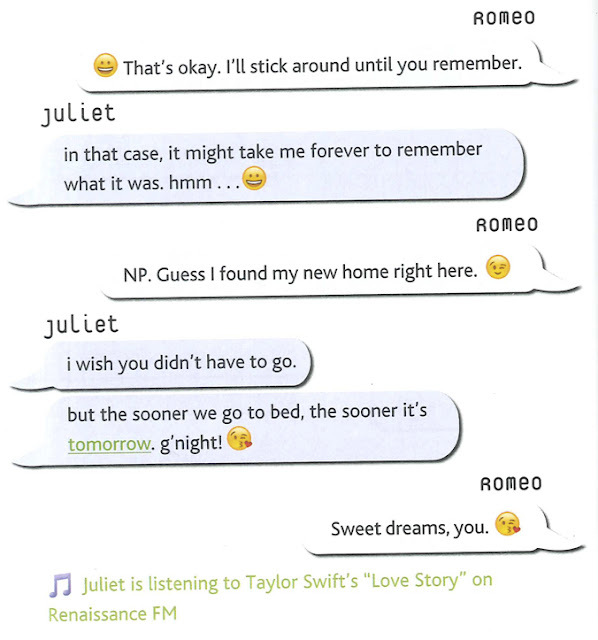 Rosencrantz is a bit clueless—he just wants to make sure she'll be at the play-within-the-play. I'm very likely to use that in future courses when we discuss the line "They aim at it / And botch the words up fit to their own thoughts” (IV.v.9-10). 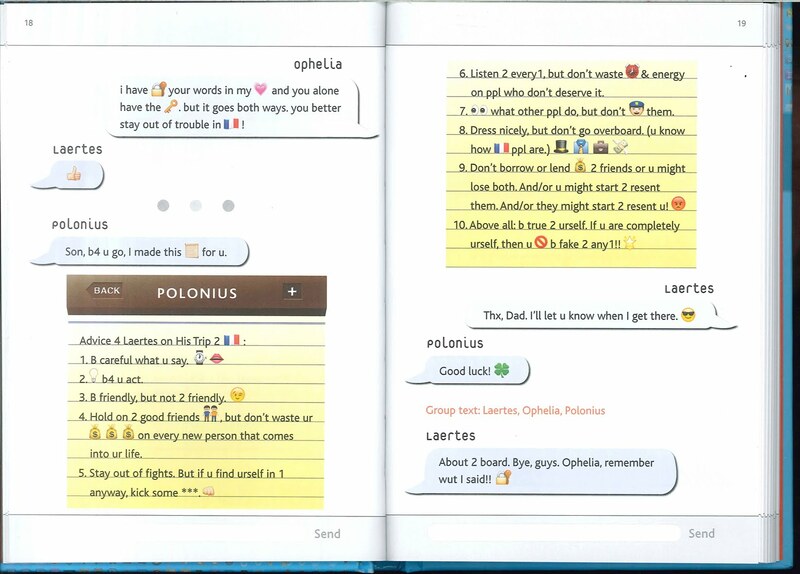 I'll invite students to see if they find any correlation between any of Ophelia's mad speeches / songs and the emojis here. And it's remarkable how, when Laertes enters, having zipped back from Paris, we get the description "Laertes has checked into Elisnore Castle—with Huge Angry Mob," under which is the delightful message "Huge Angry Mob Likes This." In short, these books demonstrate some intriguing and imaginative uses of social media to tell the stories of Shakespeare—but there's a lot of tedious rebus-esque material there, too. 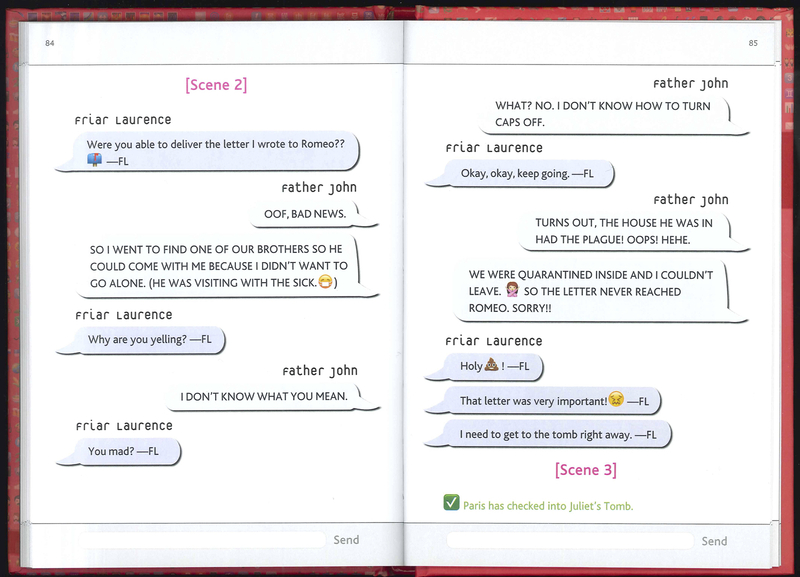 I don't think they would be of much use (or very funny) to those who lack familiarity with the plays. But for those who do (and are in the right demographic), they appear to be a hoot.